In developing nations, the current test to diagnose tuberculosis (TB) is error-prone, complicated and time-consuming. Furthermore, patients in these resource-limited areas can't easily travel back to a clinic at a later date to get their results. To make diagnoses simpler, faster and more accurate, chemists have developed a quick and easy diagnostic tool. Field trials of the experimental new test began in June in South Africa, which has a high incidence of TB. In wealthier countries, a patient suspected of having TB can be examined with a chest X-ray. Or a sample of the patient's sputum, or saliva, can be sent to a lab for testing by techniques such as polymerase chain reaction (PCR). But in developing nations with limited resources and spotty access to electricity, patients are often checked for TB with the Ziehl-Neelsen (ZN) test, which was developed in the 1880s. Technicians using this 11-step procedure put a saliva sample on a microscope slide, then dye it and rinse it multiple times. The process takes several hours. Even worse, "the ZN test is not very sensitive. It misses some cases of TB, and it gives a lot of false positives," says Carolyn R. Bertozzi, Ph.D. These limitations led Bertozzi and her team at Stanford University to develop a new test. But that wasn't the researchers' initial goal when they began studying TB 16 years ago. At the time, they were investigating molecules, known as glycolipids, in the cell walls of the bacteria that cause the disease. Each glycolipid consists of the sugar trehalose linked to a lipid, or fat. The researchers discovered that if they provided slightly modified forms of trehalose to the bacteria, the microbes would metabolize the sugar molecules and integrate them into their glycolipids. Other researchers showed that the bacteria can take up forms of trehalose in which each sugar is attached to a fluorescent dye molecule. 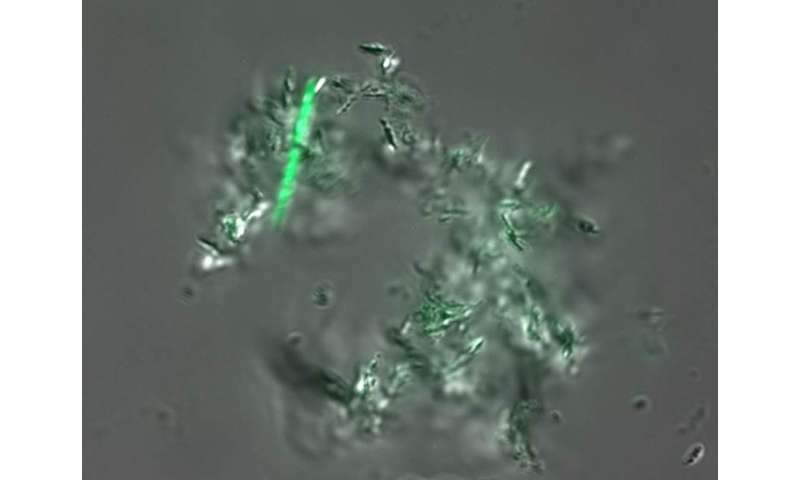 A cell that picks up these sugars glows green. "We thought we could use this to detect the bacteria in sputum samples," Bertozzi says. Unfortunately, the other researchers' dye also sticks to other components in saliva, making it tough to distinguish the bacteria. Bertozzi's team solved this problem by attaching trehalose to a "solvatochromic" dye that doesn't glow until it's incorporated into the cell walls. As a result, there's no background glow. In addition, the process couldn't be easier: The technician takes a sputum sample, squirts a little of the dye mixture onto it, and then after an hour looks at it under a microscope to see if anything is glowing. Even better, only live bacterial cells can metabolize the trehalose/dye molecules. The dyes in the ZN test, however, label both live and dead cells. That means the traditional test can't determine whether the number of live cells is decreasing, so it can't be used to tell whether a patient's treatment is working. Because many strains of TB bacteria are now resistant to the standard treatments, "if the drugs aren't working, you want to switch the patient to the next treatment as quickly as possible so you don't contribute to drug resistance," Bertozzi explains. The group is now working with a collaborator in South Africa to see how the new test performs in real-world conditions. In the meantime, Bertozzi's team is studying other fluorescent dyes that could work even better in a TB test. They are also using their current trehalose/dye molecule to explore the molecular structure and physical properties of the cell wall of TB bacteria. That knowledge could shed light on the bacteria's drug-resistance mechanism, as well as potential new ways to kill the cells. Despite significant effort in the development of tuberculosis (TB) diagnostics over the last decade, TB control programs in many endemic countries are still reliant on the detection of tubercle bacilli through sputum smear/culture. The standard methods for direct detection Mycobacterium tuberculosis (Mtb), the causative agent of TB, in patient sputum samples are the half-century old Ziehl-Neelsen (acid-fast) and Truant (auramine-rhodamine) stains, which take advantage of the propensity of the mycomembrane to bind and retain hydrophobic dyes. These tests require extensive processing steps to ensure that dye is removed from other bacteria and debris while still retained in mycobacteria. Accordingly, they have poor specificity and low sensitivity with a limit of detection between 104-105 organisms per smear. Furthermore, HIV-1 co-infected individuals, a major cohort of TB patients, present with relatively lower numbers of organisms in sputum compared to their HIV-1-uninfected counterparts, exacerbating the aforementioned limitations. And the current tests cannot distinguish live from dead Mtb cells. This limits their utility for monitoring the efficacy of drug treatments and making decisions about alternative therapies in the face of drug resistance. Consequently, efforts to advance sputum-based diagnostics by improving sensitivity and turn-around time are urgently required. This presentation will focus on our effort to develop a new sputum smear test for TB diagnosis based on metabolic labeling with the solvatochrome-trehalose conjugate DMN-Tre. This fluorogenic trehalose analog is incorporated into mycobacterial cell wall trehalose mycolates, where the DMN dye undergoes a dramatic fluorescence enhancement due to local hydrophobicity. DMN-Tre labeling is simple, fast, and selective for live Mtb due to its reliance on active metabolism. Our progress toward adapting this reagent for point-of-care detection of Mtb in patient sputum will be presented.